EyeConnect runs as a preference pane. Elgato EyeConnect is no longer available having been discontinued when Elgato sold its line of Eye TV and related products to Geniatech. This information remains on our site for archive purposes. If you're looking to stream content from your Mac to your HDTV, we would suggest using the combination of AirPlay and an Apple TV device, such as the Apple TV 3 or the Apple TV 4. EyeConnect from Elgato is an easy-to-use streaming media server that lets you watch videos, listen to music or view pictures on your HDTV. All you need is a Mac, a local network, and a UPnP AV media device connected to your HDTV. For testing, we used a Sony Blu-ray player, a Samsung HDTV, and a Mac. we saved EyeTV recordings streaming from a Mac to the HDTV in under 10 minutes. Now that’s simple. Doesn’t require any AV cabling between your Mac and your HDTV. Works with any existing EyeTV recordings. Can stream video, music, and photos. Can stream iTunes music library. Limited plug-in supports at this time. Can’t directly stream iTunes video content. The Elgato EyeConnect is a UPnP (Universal Plug 'n' Play) streaming media server that runs on a Mac and is capable of streaming video, audio, and images to an HDTV via any UPnP or DLNA (Digital Living Network Alliance) compliant device, such as a Blu-ray player that can stream Internet content. There are plenty of ways to connect your Mac to your HDTV but running a direct connection has one important drawback: your Mac must be physically close to the HDTV. This may be fine for a Mac dedicated to a home entertainment system, but what about that big screen in your bedroom, with no Mac nearby? EyeConnect addresses this problem by providing an easy way to stream media content from a Mac to any UPnP AV media player. This includes most newer Blu-ray players, Sony's PS3 game console, and some HDTVs with built-in UPnP AV support. Installation is straightforward, with an included installer that walks you through the process. EyeConnect installs a system preference pane that you use to start or stop the EyeConnect media server, select the content that will be available for viewing or listening, and view some general info about the media server's status. EyeConnect streams your selected content over your local network. This can be wired Ethernet or wireless 802.11a/b/g/n, such as Apple's AirPort system. The only requirement is that the UPnP media player must be a member of your network. Using the EyeConnect preference pane, you can select the type of content that EyeConnect will stream from your Mac. Currently, EyeConnect can stream any EyeTV recordings you have made, videos in MP4 format, music in various formats, your iTunes music library, and images. EyeConnect can't stream iTunes videos, at least not directly from your iTunes library. If the video doesn't have any DRM, it can be streamed by adding its folder to the list of places that EyeConnect will check for content. 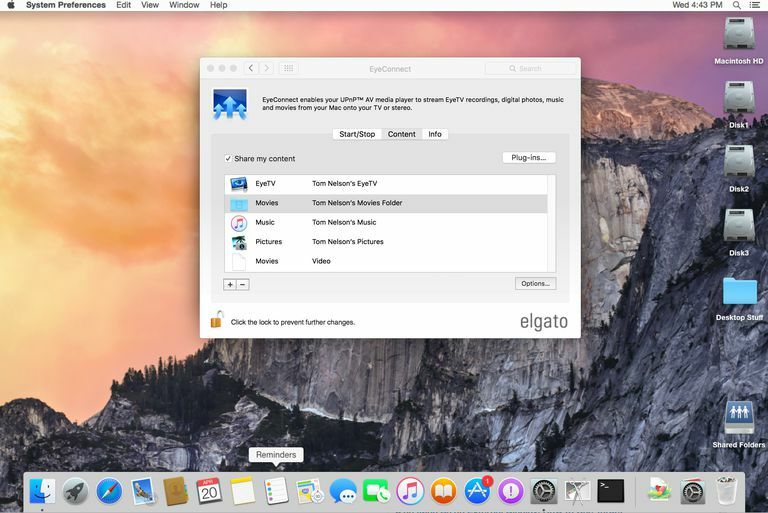 EyeConnect is a streaming server that's capable of playing and streaming content located on a Mac. It cannot stream content that originates elsewhere, such as from a Hulu feed in your browser. You also can't use EyeConnect to display your Mac's desktop and applications on your HDTV. EyeConnect is specifically designed to stream the content types supported by UPnP AV. EyeConnect is the easiest UPnP server we have found for the Mac. It works well and is easy to set up and configure. If you have a large collection of supported media types on your Mac, and a UPnP AV media device attached to or built into your HDTV, then EyeConnect may well be the simplest solution for watching your favorite movies, listening to music or viewing your photos on your HDTV without keeping a Mac nearby.